Prescient Systems & Technologies has extensive experience in the delivery of simulators and trainers for live, virtual and constructive training applications. Our virtual training simulators such as the flight simulators, ship handling simulators and land simulators provide a high level of realism to trainees through the use of high quality reproductions of operator equipment and detailed simulation of the visual and physical environment. For the Train Driver Simulator, the resulting training experience is one which is able to provide the highest level of training realism without compromising on training safety while providing significant savings in equipment and power utilisation. This also facilitates the use of the training systems as a platform to train operators of different competency levels prior to actual operation. In “Basic Train Operation” training, the newly recruited train operator is able to build-up his operational confidence in the train handling and control area, and at the same time attain competency in real-time interpretation of the various types of signalling control instructions. 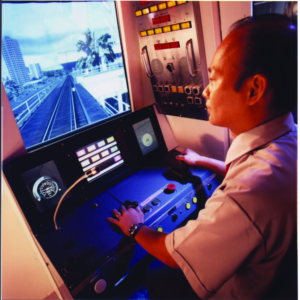 In the “Handling Train Failures and Signalling Abnormalities” training, the train operator will gain experience in detecting and identifying the various types of train failures and abnormal signalling conditions. If situation permits, the train operator is expected to remedy the failures or workaround the abnormalities. In “Line Familiarisation” training, experienced train operators will have the opportunity to orientate themselves on a new line. The familiarisation training will cover the visual scenery of the whole line, which includes all the train stations, the stations’ platform details, the signalling devices, tunnel environments (if applicable) and the different scenes along the line. This may be done under different types of weather conditions and at different times of the day based on the actual train schedule. In “Emergency Situations Response” training, which is an advanced level of operator training, the train operator will be trained to take the appropriate actions to respond to different types of emergency situations such as critical system malfunctions, cabin derails and fire as well as other issues such overwhelming crowds and track obstructions.